Looking for the best benchtop router table can be an overwhelming task with the thousands of models flooding the market. With new techniques and features almost ruling out the old versions, there are too many ideas one may have never come across. Woodworking enthusiasts would understand the importance of getting the right one and would do anything to get the one that fits the bill. 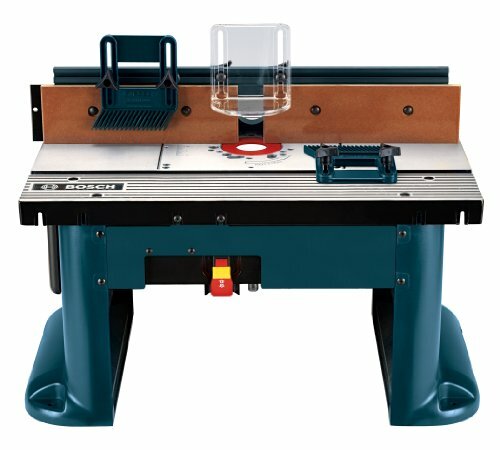 Looking for the right benchtop router table without enough resources can be daunting. In light of that, this review seeks to give you a taste of different tables that make it to the top of our list. Here, you can learn of our editor’s choice, budget pick, and best value choices as well as a buying guide. What is A Wood Router Table? Our editor’s choice for the best benchtop router table is the Bosch Benchtop Router.... Featuring two adjustable featherboards, a dust collection system, and dual outlet switch, the table is an ideal tradesperson’s asset. It also offers the convenience of attaching to any workbench for maximum usability depending on the application. Fence height: 4- 7/8 In. X 25 - 1/8 In. Multiple plates for use with multiple router brands. The Bosch benchtop router table features an aluminum top which makes it both durable and portable. The product is also designed with versatility in mind since it can fit a variety of routers. It can also be mounted on any workbench for increased convenience. For safety and ease of portability, the Bosch product features a sturdy ABS plastic base. It also features a rigid aluminum router mounting plate which is also pre-drilled for attaching a wide variety of routers. The router plate also stays flat and precise which enhances accuracy. The power on/off lock is designed to ensure there is no unauthorized use which also minimizes accidents if it falls in the wrong hands. The Bosch router table is designed with a large die-cast aluminum top (which measures 27 In. x 18 In.) which ensures job-site durability. For additional guidance and kickback protection, Bosch has ensured to design the router table with two easy-to-use and adjustable featherboards. For dust-conscious tradespeople, this router table may be the ideal asset since it features a dust collection port that can accommodate a 2 – 1/2" vacuum hose. In addition, the product has storage features for different accessories and power cable which reduces movements in and out of the workshop to look for accessories. Power lock on/off switch for safety considerations. Has a dust collection system for a cleaner and safer environment. The user manual is a bit unreliable and not comprehensive. Most designs have tables that are a bit out of flat. Surface not perfectly smoothed out. Table Size: 26" x 16-1/2"
Adjustable fence and router height. Dust collection system with a vacuum hookup port. The Skil router table features a quick-release router mount which makes attaching and detaching fast and easy. The product also comes with accessories’ storage which makes it easy to have all the needed accessories and tools at the same place and when you need them. The router table is also easy to store away or move around since it features a specially crafted folding design. The router table also features a bit height gauge which assists in the subsequent completion of the setup and also ensuring a high degree of cutting accuracy. If you are concerned about dust and exposure to it while using a router on the table, your worries are minimized as it is fitted with a dust collection system. The system also features a port that can be attached to a vacuum or any other dust collection system. Fast and reliable customer care team. Can accommodate a variety of routers. Allows the user to drill more mount holes for various routers. A bit unstable for heavy use. Does not have a user manual. A quarter turn lock on the outfeed end. 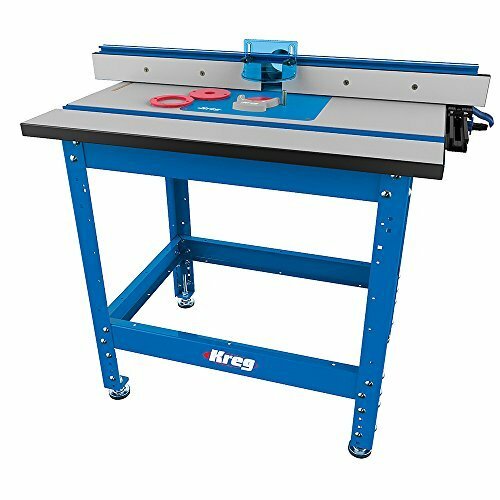 The Kreg PRS1045 router table comes with a large working surface which makes it suitable for almost any project. It also features a heavy-duty aluminum and MDF laminated fence which ensures its durability is not compromised. The router system also features an adjustable stand which allows the user to adjust the height to fit the particular task at hand. In addition, the product is designed with a micro-adjust fence which gives the user confidence for every cut and improves precision. The router system has a quarter turn lock on the outfeed end which helps in preventing fence deflection. The table is also designed to collect the dust produced thereby leaving a safer and cleaner environment. The 24” x 32” table is ideally added to the system to hold a 1-inch thick MDF core which helps to absorb vibrations which in turn helps the user to get a stable router table. The table also comes with a Trac miter gauge tea tree which makes it possible to accept a miter gauge and other accessories. Durable and easy slide surface. Adjustable measuring scale for improved precision. The fence might need more screws to fasten it. The Craftsman combo consists of a large working surface table which maximizes efficiency even for larger tasks. The combo also features a steel housing which guarantees its sturdiness and durability. With four adjustable leveling feet, the user cannot have an issue keeping the workbench level even on uneven floors. The combo also comes with a wood router and a router table which provides just enough for a woodworking learner or starter. The combo is also with a miter gauge, featherboards, and fence for increased convenience during application. The combo’s cutting depths can lock down to fit microfine adjustments. The fence also adjusts per the need. All these features ensure proper bit clearance. To ensure the combo is in the right hands, a safety lock has been fitted to it. The wood router is designed with a permanently lubricated motor and sealed ball bearing which ensures it guarantees a long lifespan. The tabletop features a thick and smooth laminated surface on top of the sturdy cast aluminum base which enhances the durability. If you need a safer and cleaner working environment, the table in this combo may be the right one for you since it has a dust extraction port that can be connected to a fitting dust collector. Considerably cheap for a combo. Only performs well for smaller projects and for people starting woodworking. The table is prone to warping. Poor quality fencing material (plastic). Length x Height: 14.5 in. X 15.875 in. The Bosch cabinet style router table has a tall aluminum fence which features adjustable MDF face plates. The fence also ensures it can support taller workpieces. They also allow the outfeed to be offset for jointing. The router table is designed with a rigid aluminum router mounting plate that stays flat and precise for increased accuracy. The plate is also predrilled to ensure it fits a variety of routers. It also features two adjustable and easy to use featherboards that are attached to the fence and table. The featherboards provide additional guidance as well as kickback protection. For a cleaner and safer environment, the router table has two dedicated dust collection ports that can fit a standard 2 – 1/2-inch vacuum hose. The table is also fitted with a mountable base that features four pre-drilled holes for driving screws in. It also has a flat extension, features that allow the user to clamp it to a workbench with ease and for convenience. Rigid aluminum router mounting plate. A stable and easy to use fence. The track cannot be used with any other tool such as a sled, jig, or miter gauge. The featherboards have plastic parts that slide quite often. For both professionals or beginner woodworkers, the number one goal while looking for a benchtop router table is getting one that meets their needs precisely. Even though other specifications like the workspace size and ease of use play a big role too, the purchasing decision is mostly dependent on customizability. It is everyone’s dream to grab a router table that they can use with the basic router plus a myriad of others. A router table is a specialized type of table that is designed to hold a power tool, usually an appropriate hand-held router. The router is fixed upside down and to the underside of the tabletop with the router's cutter or bit protruding on the surface through a hole on the table. A workpiece, like lumber, is then passed along the table's surface and over the cutter or bit for shaping or cutting. Each table is designed in a specialized way to fit various needs. The tables also come with a myriad of accessories that help with finely tuned cutting or shaping tasks. The accessories also help to increase the router tables’ versatility. The free-standing router table is usually the larger of the two and can be used as a standalone table. However, it is often designed with removable legs transforming it into a benchtop router table. Conversely, a benchtop router table is the smaller of the two. It is also lightweight in design which makes it easier to move around with. Also, the table is designed for use on another table or table-like surface like a bench and features brackets for easy and secure fixing on the table top. Every router table comes with some basic parts. The parts may be on different positions though, depending on the model. However, if anything seems to be out of the ordinary, a user manual will always come in handy with each part of the table indicated. The table guard is usually a simple plastic cover that is placed directly over the router bit. The guard’s work includes preventing the hands from getting too close to the cutter when the machine is running. It also helps in directing wood chippings and dust below the table or behind the fence where a dust collection port may be located. This is a thin and straight board that works as a guide. It is securely fixed on the tabletop but can also be moved across the tabletop and clamped in different positions depending on the materials’ sizes. The fence also helps to control the shape and position of the cut as it helps in guiding and supporting workpieces as they move past the cutter. The port is located behind the guard and fence. 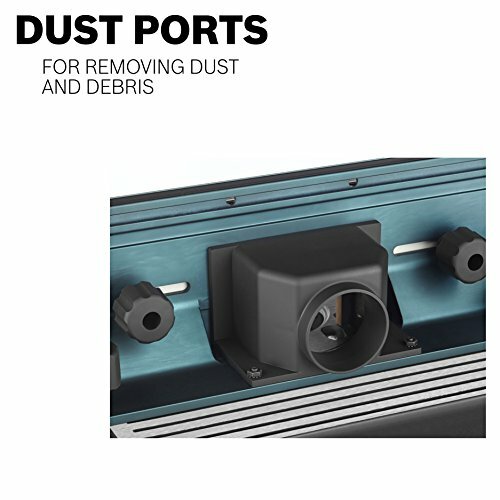 The port allows for fixing of a dust extraction system like a vacuum or cyclone dust extractor. This is a grove spanning the tabletop’s length and designed for a miter fence. It allows the fence to slot into and move across the table conveniently. A router table insert plate is a device designed to hold the router to the table. The base of the router is fixed to it using screws, and it is then mounted at the center of the router table. This makes it sit flush on the table top, and a cutter protrudes through a hole at the center of the plate. The plate may also have pre-drilled screw holes if one needs to fix different routers. The holes can also be altered using insert rings. The switch is a power button which is a relatively common feature in modern power tools. It is designed as a safety mechanism and helps by cutting all power to the tool whenever there is a temporary power loss. This also prevents the tool from running unattended when power returns unexpectedly. Router table miter fence or miter gauge for guided straight and angle cuts. Router table lead on pin (also called a starting or shoulder pin) used for supporting workpieces as they make contact with the cutter. Router table insert rings (also called a reducer or insert plate ring). The mechanism behind a router table is based on flipping the router upside down. With the router facing upwards, it means the spin direction of the bit is also reversed and so is the feed direction. This also means that the bits will spin in an anticlockwise direction while cutting or shaping a workpiece. If you are routing the outside edge of a workpiece, then you will need to feed the wood from the left side of the work surface (the table). The direction will be from the left to the right while forcing the bit to push your wood back against you. If the router is also attached, its bit also presses the wood against the fence. It is important to maintain the resistance against the bit if the cut has to remain under control. This resistance also helps to determine the right amounts of force needed as well as how fast the wood can move past the bit for a cleaner cut. Always ensure the router is unplugged from the power source when changing the bit. Use a solid fence whenever possible. Always move the workpieces from right to left against the fence. Work by moving workpieces in an anticlockwise direction around a piloted bit. Avoid removing too many materials per pass. Try to use push sticks and featherboards to ensure your fingers are as far away from the bit as possibles. Understand climb-cutting and when it should be used. Use anti-noise ear-protective headphones, specialized eyeglasses, and dust resistant gear like nose masks. Ensure the router table is firm and sturdy and does not move during the cutting or shaping. Always try to use the infeed and outfeed supports where necessary. Ensure to cover the bit with the recommended guard whenever possible. Always read and follow any user manuals provided. The first consideration should be how accurate the fence of each available tables is. Working with a poorly adjusted fence might take you longer to finish working on a workpiece. You can also consider a table based on whether it has a one-piece or two-piece (split) fence for optimum alignment success. The most crucial part of a router table is a flat surface top. It is important to know beforehand that there are tables without such surfaces and may not be the right choice for you. A router table that comes with a dust collection port should be top on your shopping list. Such a table will help you observe a safer and cleaner environment. If it does not then you will have to look for ear, nose, eye, and lung protection gear. A miter gauge helps to hold a workpiece accurately and helps to secure featherboards and other accessories. T-slots help to secure the featherboards, stops, and other attachments. These are features that should not be ignored either while shopping for a router table. While looking for a router table, ensure to get one with a good and stable base. A stable base helps to minimize movement and consequently reduce accidents. Q. Is a router table costly? A. That depends on different factors like the brand of the table, manufacturer, retailers, design, and available accessories. Q. Do router tables have speed control? A. This depends on the table as some have while others do not. Q. Is using a router table beneficial? A. Yes. Apart from being more effective, it guarantees more safety and precision compared to other routing methods. Q. Can I use my router table with any router? A. This depends on how versatile the table is. Most tables are compatible with an array of routers though. If it does not, you can get a variety of pre-drilled plates to help you fit any router to any table. Make sure to follow the user manuals as indicated by manufacturers. We feel that the Bosch Benchtop Router... fits our editor’s choice for the best benchtop router table. The table is versatile enough to attach to any workbench, has adjustable featherboards, and an aluminum routing plate. If you are not friendly with dust, the table also features a dust collection port. For the budget-pressed woodworker, the Skil RAS900 Router Table comes in as our budget pick. With storage containers for accessories, a bit height guard, and a quick clamp system, the table fits the bill. It also has two featherboards for increased accuracy.